The All-New Range Rover Sport will be showing its dynamic prowess on the Goodwood hill in the 'First Glance' category. 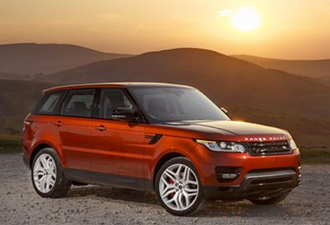 Featuring a 5.0-litre 510 bhp Supercharged V8 engine, Land Rover's fastest and most agile Range Rover to date will be off the line from 0-60 mph in 5.0 seconds flat, conquering the hill twice a day from Friday to Sunday. The Range Rover Sport will also take centre-stage on Land Rover's largest ever Goodwood stand for visitors to come and explore. In addition, Land Rover's full line-up of all-terrain vehicles will be on display including the All-New Range Rover, Range Rover Evoque, Land Rover Discovery, Freelander and Defender. 2013 sees Land Rover's legendary off-road course - a unique feature at the annual Festival of Speed, integrated with the display stand for the first time. The track which circles the stand will see the new Range Rover Sport put to the test across various obstacles demonstrating the new model's class leading articulation, suspension-travel and Land Rover's Terrain Response® 2 Auto. Customers will be able to experience the car first hand by participating in passenger rides on the course at no cost. Celebrating the Race2Recovery team of injured soldiers' success in being the first disabled team to finish the Dakar rally, members of the team including Captain Tony Harris (driver) and Barney Gillespie (navigator) will be conducting talks during the show about their achievements in South America earlier this year. Visitors will be invited to come and hear the team speak about how they overcame adversity to finish the toughest race in the world. In addition, the Bowler Wildcat rally raid car, based on the iconic Land Rover Defender which crossed the finish line, will be on static display. With something for everyone, families with children will be able to race mini Race2Recovery Wildcat radio-controlled cars on a tough and gruelling Dakar-esque off-road course. Land Rover owners will be able to enjoy special facilities at the Festival of Speed, with admission to a private hospitality centre offering complimentary refreshments. Located on the stand, access can be gained on presentation of a Land Rover key fob. In addition to Land Rover's presence at the Goodwood Festival of Speed, Bowler will also be conducting passenger demonstrations on the rally track in their EXR rally raid cars which are heavily based on the 2012 Range Rover Sport. Jaguar Land Rover's UK Managing Director, Jeremy Hicks said: "The Goodwood Festival of Speed is a stand-out fixture in our annual calendar of events, and with Land Rover's largest stand-to-date we have so much to offer customers from the off-road experience in the All-New Range Rover Sport to the inspirational Race2Recovery talks. "Added to our award-winning line up of all-terrain vehicles on display and something for the whole family, we very much look forward to welcoming customers and visitors to Goodwood on the Land Rover stand." The Goodwood Festival of Speed opens its gates at 07:00 on the Friday 12th July with the hill climb commencing at 08:45.